To all student journalists: Stay Safe! Are you a student journalist? Are you being asked to get out of the classroom and “learn by doing” through street reporting? Are you a journalism professor? Do you send your students out to cover real events? Here’s an introduction, based on a panel discussion we held in September for more than 100 students. The idea is simple: When the April 2013 Boston Marathon turned in an instant from a feel-good feature story into a violent tragedy, many of us on the Journalism faculty realized that we need to do a better job to train our students in basic safety techniques. Working with veteran correspondents from our own faculty, as well as front-line professional reporters and photographers, we are trying to distill the hard-won experience of covering wars, riots, fires, blizzards, and other forms of mayhem into a set of practical guidelines. Before our students venture out again, we want to make sure they go out there equipped with the “best practices” we can share with them. Have a look at the video. Still to come: a permanent space on the BU Journalism website with guidelines, training videos, links, and a display of recommended gear for all student journalists. If you have suggestions, please leave them in the comments here, or email Chris Daly: chrisdaly44@gmail.com. Thanks. . . and stay safe! 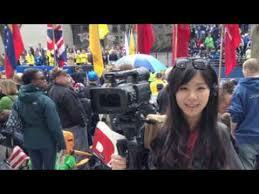 Boston University journalism student Kiva Liu, working near the finish line of the Boston Marathon, moments before two bombs exploded. She survived. The latest annual survey of job prospects in journalism, conducted by the Grady College at the University of Georgia, is out. The job market for graduates of journalism and mass communication programs around the country showed signs of improvement in 2010 and the first half of 2011, though the improvements are tentative and the market has not yet returned even to the level of two years ago. The 2010 graduates were more likely than graduates of 2009 to report having at least one job offer on graduation, more likely to report being employed at the benchmark date of the end of October of last year, and more likely to hold a fulltime job six to eight months after completing university studies. The jobs the graduates held were more likely to be in the field of communication in 2010 than they were in 2009. Been down so long it looks like up to me!